Where are we heading with this? There’s a moment on any epic journey – a brief moment, maybe of self-doubt – when you pause (mid-sentence, perhaps) to wonder exactly where you’re headed. This week’s pause, this check, comes just as we approach the midpoint of the KYP series – four done, five to go. Time, then, to check the plan, time to summon energy, time to pull together and push on. Time, maybe, for a small course correction? KYP – ‘Knowing Your Place’ – was always an unlikely blog series but from the outset it had great structural underpinning. Most of the episodes had been well rehearsed – albeit with different headlines – and needed only an injection of current relevance for a new audience. 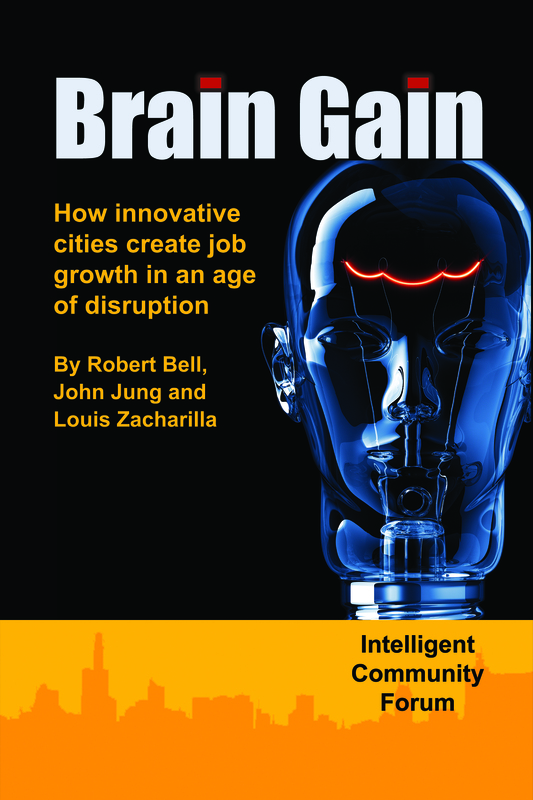 With just one exception the planned topics were neatly summarised three years previously in the concluding chapter of Brain Gain – a book that captured more than a decade of learning through the Intelligent Community Forum. The single exception is a key indicator that has since crept far more clearly onto the community agenda – largely, it should be said, through the work of the Rockefeller Foundation and their 100 Resilient Cities network. It might once have been argued that Resilience was but a subset of a longer-standing ICF Key Indicator – Sustainability. However, headline tones get burdened by baggage – a peaceful green is not on the same wavelength as urgently-flashing red and blue lights of public safety. When the Intelligent Community Forum gathers in London next June, their 2018 root theme, Humanising Data, will no doubt be coloured by recently raised awareness of data privacy issues and the impacts/consequences of ‘artificial intelligence/ignorance’ – but in our KYP series the blog-prep for Sir Nigel Shadbolt’s input is still two weeks away. For readers remaining mystified, links to the series so far are listed below. At the outset, the central question, the question that is bringing so many brilliant speakers and community leaders together next June, was deceptively simple: Why do some places thrive whilst others decline? I’ve checked the waypoints. We seem to be on course, but the next five weeks is a long journey. Still to come in this series are thoughts on local Advocacy (Who do we think are? ), Open Data (AI in city infrastructures), Innovation Capacity (Pacemakers for Place-makers), Sustainability Engagement and finally Resilience. Fortunately, ICF is inherently collaborative and, with inputs from summit speakers, the driving can be shared. By the end of May, homework complete, all delegates – whether from the UK or the other side of world – will be fully prepped and prompted to probe the great gathering of expert speakers and community leaders at the ICF Global Forum. Knowing Your Place – that place you call home. 3 Where Have All Our Flowers Gone? Part 5 – ‘Who Do We Think We Are?’ is scheduled for publication on 2ndMay.